Paige Elizabeth Darling loves her grandmother and especially loves to visit her. She and Gramma do many things together: They play, bake cookies and enjoy sitting in Gramma’s old blue chair to read. Only problem is: All of Gramma’s pets love that chair too, which makes it extremely crowded. One day while Paige and Gramma are sitting and reading, Paige looks around and notices that all Gramma’s critters have toys of their own. She asks Gramma if she can have a toy of her own, too. Gramma promises to make her something very special. The next morning when Paige wakes up, she finds a stuffed bunny Gramma had made from calico cloth. Paige decides to call the bunny “Bun Bun Button.” Gramma includes a special pocket in Bun Bun’s ear for Paige to nuzzle against and get comfort. Wherever Paige goes, she brings Bun Bun along. When they return home, Paige decides Bun Bun would like to fly. She ties the bunny’s arm to the balloon string, only to be whisked away by the wind. Where did Bun Bun go? Has Paige lost her stuffed animal for good? What kind of adventures does Bun Bun encounter on her travels? Will Paige ever see her beloved toy again? 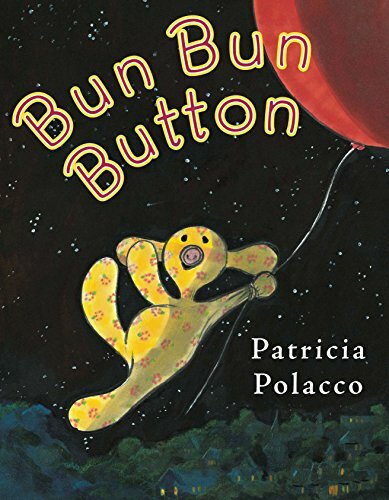 Ms. Polacco knows how to touch children’s hearts with her poignant tales, and Bun Bun Button is no exception. Colorful and playful watercolor illustrations enhance the text, which portrays the deep the bond between a child and her grandmother.